In the food industry, it seems, the robot revolution is well underway, with machines mastering skilled tasks that have always been performed by people. Removing the human element from ordering a cup of coffee is one of the company's primary selling points. "No more lines, no more counter confusion, no more misspelled names," Briggo's website says, flicking at human failings. Briggo said all eight of its machines are owned by the company, but they've recently begun offering a licensed business model to prospective operators. The company didn't reveal how much that business model costs, but noted that rent and revenue-sharing arrangements are typical when a machine is placed in a public location, such as an airport. Kevin Nater, Briggo's president and chief executive, said the machine would thrive in locations in which convenience is highly valued, like airports and office buildings, where several of the 10-foot by 4-foot machines currently operate. "Imagine you're coming into the security line at the airport, your flight is coming up, and you know that if you want a coffee you're gong to stand in a long line," said Nater. "From the security line, you can simply order your cup of coffee and pick it up at the coffee haus and make it to your flight on time." "I've never found anyone who wants to stand in line a long time," he added. "We've just changed the game." It seems others agree. This year, Fast Company named the Austin, Texas-based company one of the 10 Most Innovative companies in the world. 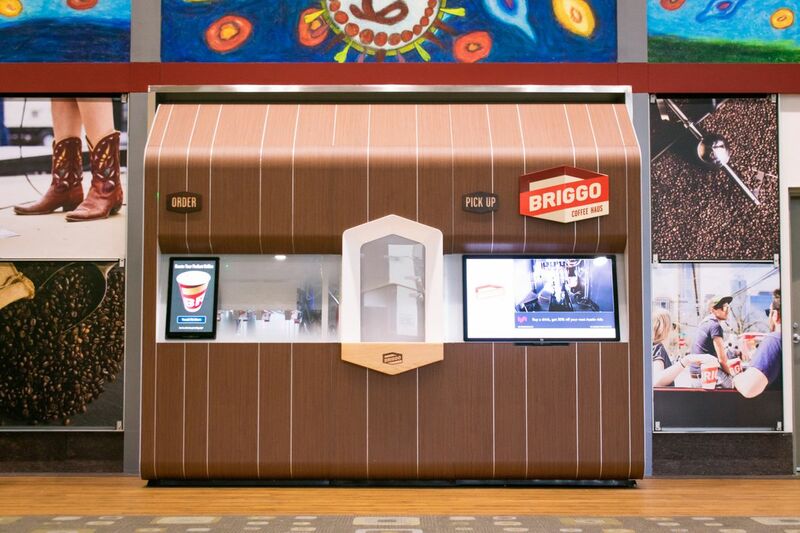 Assuming both companies grow, Briggo may someday compete with Cafe X, an automated coffee bar from San Francisco that uses assembly line-style machines that promise your cup of joe will be engineered with "robotic precision." The machines arrive at a time when ready-to-drink coffee, such as bottled drinks found in supermarkets and convenience stores, continues to explode in popularity, according to CNBC. Nater said he has no doubt his machine makes cups of coffee as well, if not better, than a human barista. Referring to the robot as a "high speed, totally controlled food factory," he said that unlike human workers a machine doesn't get flustered when business gets busy. By looking at analytics, he said, he can ensure that the robot is hitting "all of it's quality marks." But Oliver Geib, a 24-year-old barista at Ceremony Coffee Roasters in Annapolis, Md., remained skeptical. As coffee is being made by a barista, he said, subtly gauging the ratio of water to grind as flavor develops through refined taste tests, is a crucial part of the process. "All the numbers and data in the world can't actually tell you how the coffee tastes," Geib said. "A big part of what a human brings is being able to taste the coffee during the process of dialing in the flavor." Fast-food restaurants like Starbucks, Wendy's, Panera and McDonald's encourage customers to order using self-service kiosks or a mobile app. Asked how Briggo would impact employment, Nater said food service companies have a hard time retaining workers and are often short on staff, especially in airports where turnover is high. "We don't think we're replacing people," he said. "We are creating a high tech retail and marketing business and developing jobs in the process. We just hired two people in the Bay Area, where we are opening a new location in the spring." But automation critics claim that machines ultimately harm more workers than they help. Last month, Erikka Knuti -- communications director for the United Food and Commercial Workers Union -- said too many businesses treat customer service as a line-item cost instead of an investment. In addition to eliminating jobs, she said, removing people from transactions degrades the product that businesses are selling. "Retailers and businesses underestimate the importance of the customer service interaction -- that point when a customer hands over their money and they get a warm smile in return that tells them they're valued," she said. Asked whether he was worried about losing his job to a robot, Geib said, "absolutely not." Though he sees the value of robots making coffee at particular locations when customers are short on time, he said there's a loyal group of people who will always seek out the slower, interactive experiences at coffee shops.